Southern Sales & Service, Inc. 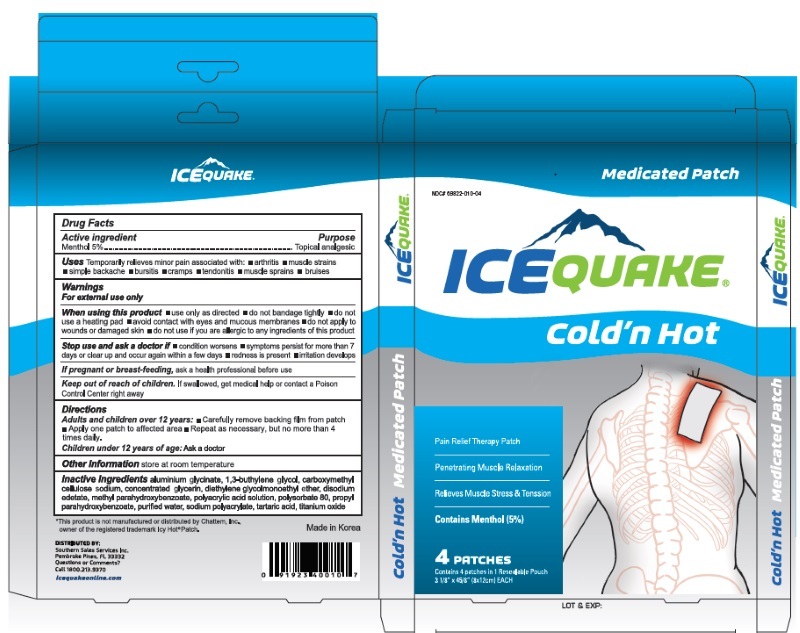 Proprietary Name: Icequake Cold Hot What is the Proprietary Name? 69822 - Southern Sales & Service, Inc.
Icequake Cold Hot with NDC 69822-010 is a a human over the counter drug product labeled by Southern Sales & Service, Inc.. The generic name of Icequake Cold Hot is menthol. The product's dosage form is patch and is administered via topical form. Labeler Name: Southern Sales & Service, Inc. Adults and children 12 years of age and over: Carefully remove backing from patch. Apply one patch to affected areaRepeat as necessary, but no more than 4 times daily. Children under 12 years of age: Ask a doctor. Use only as directed ■ Do not bandage tightly.■ Do not use a heating pad.■ Avoid contact with eyes and mucous membranes. ■ Don’t apply to wounds or damaged skin.■ Do not use if you are alergic to any ingredients of this product.